I’ve implemented a long-time request, providing a page that shows you what “works” you have more than one of. For a long time, your fun statistics (yours|someone else’s) page has provided both “Number of books” and “Number of distinct works. In fact, the calculation was subtly wrong. In the process of fixing it, I went ahead and make a work multiples page (yours/someone else’s). We didn’t know about the vote, and didn’t ask people to help us. But we ended up among the winners anyway, alongside titans like Flikr, GMail, Digg and Writerly. In fact, except for Dimewise—which appears to have almost no traffic—we have the lowest traffic of the list, so presumably the fewest users. That we MADE the list is testimony to Thingamabrarian passion. So, whoever voted for us, thanks! The story behind this here. We’ve done something piratical, and we’re giving you the loot. As you may know, there are sites out there that let users swap books. In fact, there are more than a dozen of them. LibraryThing members are using most of them. We don’t want to swap books on LibraryThing, but we thought it would be a great idea if LibraryThing integrated with a swap site, letting you know when books were available or wanted, and letting you move books back and forth. Unfortunately, most swap sites want to be the ONLY one. They want LibraryThing to favor them, in exchange for this or that incentive, and leave their competitors marooned on a desert island. We think LibraryThing members deserve more respect than that. After weeks of repetitious conversations, we were sick of the regular navy—it was time to turn pirate! So, we just did it, without asking permission, without deals—and without revenue sharing. We’ve set up the infrastructure to work with all sites and send them all details (I’ve put them up on the Thingology blog.) If swap sites tell us what they have available, and make the links work, they get to join our crew. Although all swap sites get to participate, we’re putting them in two categories. Sites that let give as well as get—integrating with LibraryThing as we integrate with them—get top billing, with a logo and everything. The others get 9 point text. We hope they’ll be more generous once we start promoting their rivals, and when users who use them as well as LibraryThing demand the same flexibility other swap sites provide. So far, four sites have said they’ll join our pirate vessel, and two have done the necessary work: BookMooch and WhatsOnMyBookshelf. (Update: In the comments, Read It Swap It says it’s on their list too.) Welcome to these great sites. We applaud your sense of openness and eagerness to serve your customers! What’s live now: Book pages show how many books are available and wanted (available/wanted) on participating swap sites. True synching. We’ll publish a simple spec, and ask swap sites to help us make it a reality. Catalog integration. Whether we put it on the catalog by default depends on how many users end up using the swap services. *The story: The cognoscenti will recognize Nancy Pearl‘s Book Lust. 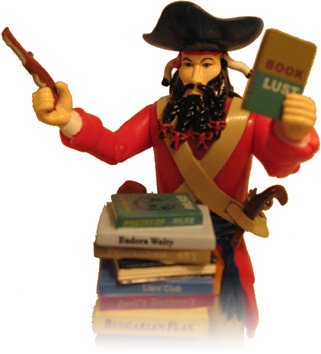 Book Lust and the other books come with the Librarian Action Figure, of which Ms. Pearl was the model. The same company produces a Blackbeard action figure. So, I did an action-figure mash-up. (It’s unclear what business expense category action figures fall under—office supplies?) Actually, this is the second Nancy Pearl figure I’ve bought. I lost the first figure, but I still have the stack of books. They’re different books than the new ones. I have no idea why, except the first stack seemed to trivialize reading somewhat—Bulgarian Flax was one of the books. Check out the tag signed on LibraryThing, and look at the top books. Those are weighted by book popularity. Here’s the raw (unweighted) numbers. The data are clear: Neil Gaiman is a machine! Both lists start with his American Gods and from the full list six of the top seven are by him. From Gaiman’s author page you can tell he’s signed 193 books on LibraryThing. Of all signed books on LibraryThing, 1% were signed by Gaiman. (Compared with only two books signed by J. K. Rowling.) Calculating that maybe a quarter of users employ tags, it stands to reason that his pen has passed over something like 800 books on LibraryThing—and LibraryThing is a speck in the ocean of books. What’s up with this guy? In related news, I spent Thursday and Friday touring with my wife, in support of her new book Every Visible Thing, doing Toad Hall Books in Rockport, MA and Brookline Booksmith in Brookline, MA. * Touring with a six-month old baby is pretty hard. I spent most of it, including all of the readings, walking around with Liam in a sling. Between the car seat and unfamiliar places, he slept terribly. After two days, all three of us were wrecks. We’ve been recovering since. So, I’ve decided that—clearly—Gaiman has no children. Damn. I just checked. He has three. As far as I can tell from his blog, he isn’t neglecting them either. I think I’ll go back to bed now. *Booksmith is an old favorite—Lisa and I used to live around the corner, and Lisa worked there—but Toad Hall was a new discovery for me. They’re tiny, but obviously beloved. And they really go for my wife’s books. In the last year they managed to sell 99 copies of her second book, In the Country of the Young—my favorite but probably her low-seller—apparently by just telling people to buy it. A chain bookstore can’t do that sort of thing.